The instructions posted there date back to version MAME 0.104u6. As of version 0.117u, MAME moved many configuration settings to the core mame.ini file, making DerrickÕs directions still relevant but needing some crucial updates. Updates to DerrickÕs instructions, including the following Addendum, appear here in blue, and have been written by Scott Miller, scottmiller@sc.rr.com for ACT Labs http://www.act-labs.com/. At the time of this update, MAME was operating with version 0.125u, June 3rd, 2008. As of version 0.104u6, MAME contains code that allows you to use multiple light guns in MAME. You can use more then 2 light guns, as long as the total number of mice plus light guns does not exceed 8. This functionality only applies when running this MAME on Windows XP. Older versions of Windows use the regular functionality as described in the documentation supplied with the guns. Hooking up the light guns is the same as in the documentation. Except that you can use more then 2 devices. Any combination of 1-Player and 2-Player guns can be used. They will each be recognized individually. The following picture shows how to connect 3 light guns together. If you have the 2-Player light gun, you can leave the mode switch on position 1 for normal shooting. You can then use position 2 to change the 2 buttons from buttons 1 & 2, to buttons 3 & 4. Giving you the ability to control extra functions. When in position 2, the trigger button is now button 3 and it also updates the cursor position when pressed. This allows you to map button 3 as a grenade button for games that use it. So with a 2-Player gun you can set the mode switch to position 1 for regular shooting. Then flip it up to position 2 with your thumb, and fire off a couple grenades. Then flip the switch back to position 1 and continue shooting. 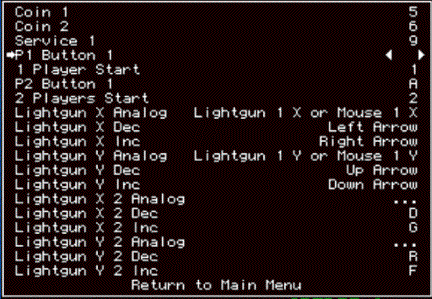 In MAME, you no longer need to use the -lightgun or -dual_lightgun commands. But you must use the -mouse command, and the -multimouse command. If you are running a game that needs you to shoot off screen, you will still need to use the -offscreen_reload command. This will change the functionality of button 2 to simulate firing off screen, thereby reloading. 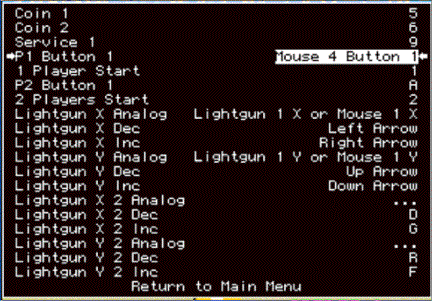 For recent versions of MAME, mice and light guns are considered the same. The test setup I used had 3 mice and 2 light guns. The mice are Mouse 1, 2 & 3. The light guns are Lightgun 4 & 5. This does not mean that you have 4 or 5 light guns. This is just the mouse position windows assigns them. With light guns, only the X,Y axis data is different then the mouse data, so you will see the buttons reported as mouse 4 & 5 and the X,Y axis are reported as Lightgun 4 & 5. Your mouse and light gun numbers may be different then the numbers show here. -r 800x600 -refresh 60 = sets the game to use a fixed resolution and refresh. This is so you do not have to constantly re-calibrate your gun. When you are in the game, you will need to select the light gun as a control. Do this by pressing the [TAB] key. You will now see this menu. 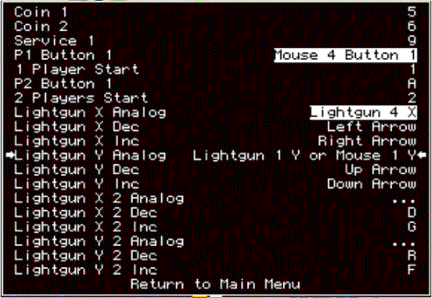 It shows "Mouse 4 Button 1" instead of "Lightgun 4 Button 1". This is normal. A light gun is a mouse. Only the X,Y data is different. Éthen you must stop configuring for the moment, exit MAME, and follow the instructions listed in the Addendum. You need to configure your Òcore input automatic enable optionsÓ correctly. If you didnÕt point your lightgun at the screen when you pressed the trigger, it is still possible to get a simple statement like ÒMouse 4 Button 1Ó. However, if your system requires correcting your core configuration settings, not pointing your gun at the screen for this step will not fix your configuration problems. Therefore, itÕs important that your gun was pointing at the screen when you pressed the trigger to see if you need to follow the steps listed in the Addendum. Now we need to move on to selecting the light gun axes. Move down to highlight the "Lightgun X Analog". Do not press enter yet. Do not press enter yet. This is a common mistake. Double check to ensure you HAVE NOT pressed enter yet. Before we can proceed we need to position the light gun on the left side of the screen. Point at the position shown here and fire. 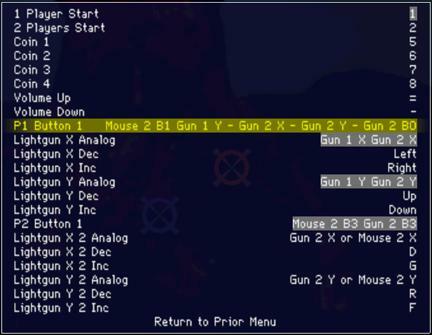 Now press enter to allow selection of the light gun's X axis. We will now move to the right side of the screen and fire at the position shown here. Try and keep the vertical position close to the same line. We will repeat the procedure for the Y-axis. Move down to highlight "Lightgun Y Analog". Before we can proceed we need to position the light gun on the top half of the screen. Now press enter to allow selection of the light gun's Y axis. We will now move to the bottom half of the screen and fire at the position shown here. Try and keep the horizontal position close to the same line. You now should have the Y-axis selected. Repeat the whole procedure for the other players as needed. 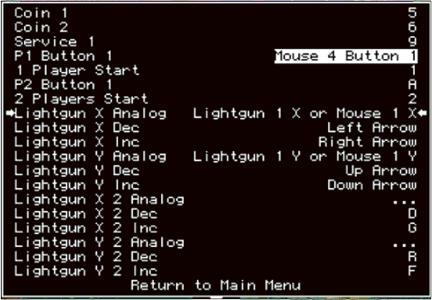 If you are interested in knowing what mice or light guns are reported as which Mouse in MAME, try using the verbose command. When you quit the game you will see a list showing each device. By making a separate configuration file for a specific game, you prevent changes you make for that game from affecting all other games. MAME will first look for a specific .ini file in the ini folder before resorting to the default mame.ini. For simplicity, this tutorial will work with the mame.ini itself. Open mame.ini using textpad or any other simple text editor. In the mame.ini file there are several things you need to configure to make your lightgun work properly. To find them, simply do keyword searches for the things you are looking for, or scroll the length of the document until you find them that way. 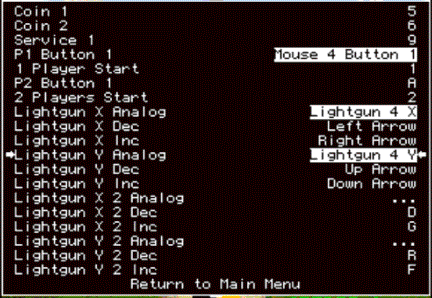 After configuring your mame.ini, it is advised that you go back to the directions found in the tutorial above and finish your light gun set up. If you've followed all of the above, your lightgun should function correctly. You may still need to calibrate it, using the directions already provided by ACT Labs. Be sure and check out the Pearls of Wisdom which follow to maximize you lightgunÕs potential. To turn off the crosshairs in lightgun games... press "F1". To calibrate some of the lightgun games, (luckywld, area51 among others) you need to hold down "9" and press "F2" to bring up the game's calibration and test menu. You must calibrate both Player1 and Player2, otherwise not even Player1 will function correctly. ÒTerminator2-Judgement DayÓ, while it looks like a light gun game, is actually an analogue joystick game wherein the joystick looks like a gun. Players often get frustrated trying to calibrate their light gun on this one, and of course it won't work. You need to calibrate an analogue joystick stick for this. GollyGhost needs updated background artwork, which is available here http://aarongiles.com/mameart/. Otherwise the ghosts are just floating around on a black background. MateTesters confirmed as of MAME version 0.77, Òoffscreen reloadÓ was broken. It has since been addressed for most titles. Some games allow button two on the ACT Labs LightGun to be configured to the Òoffscreen reloadÓ function. YouÕll know these games because there will be an option to set this in the gameÕs input configuration menu (to open this menu, press [tab] while in the game). Some other games, where ammunition supplies were not an issue, compensated by reloading automatically with every shot, or periodically. If your favorite game doesnÕt reload, keep your eye on MAME updates, IÕm sure they are working on it.